Folded brochures can come in a variety of shapes and sizes, and the style you choose will depend on what you plan to use them for. For standard flyers, opt for a single fold brochure, which has one single crease along the middle and can display text horizontally or vertically. 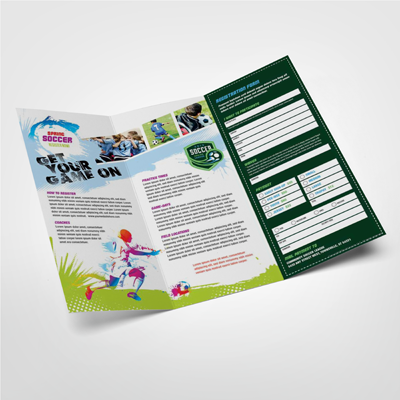 A gate fold brochure is ideal for printing takeout menus, with the restaurant's contact details printed on the front and back, and the menu listed on the three inner pages. 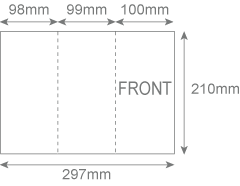 Alternatively, the three inner sections could display continuous artwork or text - our creasing technique means that your printing won't crack along the fold lines. Like a gate fold, a concertina fold also offers up to six printable sections, and opens out like an accordion. This style is ideal for larger sized paper, as it can be folded down into more manageable handbag and letterbox friendly proportions. An engineering fold is a more unusual option, with a smaller flap to the front of the brochure, and a wider sheet at the back. All our folded brochures are available in the standard A4 size, which measures 210mm x 297mm when folded flat or in the larger A3 size which measures 297mm x 420mm. Choose from a range of options, including gloss or silk paper, in 170gsm, 250gsm or 300gsm card. We can also offer a bespoke service on request, which can include laminate or matt printing and a variety of sizes of paper.